Home > Events > May is Invasive Species Action Month! It’s time for ACTION! May has been officially proclaimed Invasive Species Action Month in BC. Join CSISS for a number of free events listed below. Be on the look-out for our Invasive themed weeks on Facebook. Beginning May 1st, we will be showcasing an invasive species of the day on social media! Be sure to follow us on Facebook to learn how to identify, report and manage these alien invaders.Find us on Facebook! The Columbia Shuswap Invasive Species Society is hosting a one day free wetland restoration and invasive species workshop with the BC Wildlife Federation, in partnership with the Columbia Mountains Institute. The workshop date is July 27th, 2017 in Revelstoke BC and will dovetail with the Columbia Mountain’s Institute Wetland Plant ID course. This workshop will provide an overview of steps involved in restoring a wetland, including site selection, design considerations, and permitting requirements.The presentation will also share examples of wetland restoration in the context of managing invasive species, some of the successes and some of the challenges in BC. Following morning presentations, the participants will travel to a site to receive hands-on training in wetland restoration design. To register, email your name and your affiliation to: info@columbiashuswapinvasives.org or call us on 1-855-785-9333. CSISS has some new staff members this year! CSISS would like to give a warm welcome to Sue Davies, our new Aquatics and Outreach Program Coordinator. 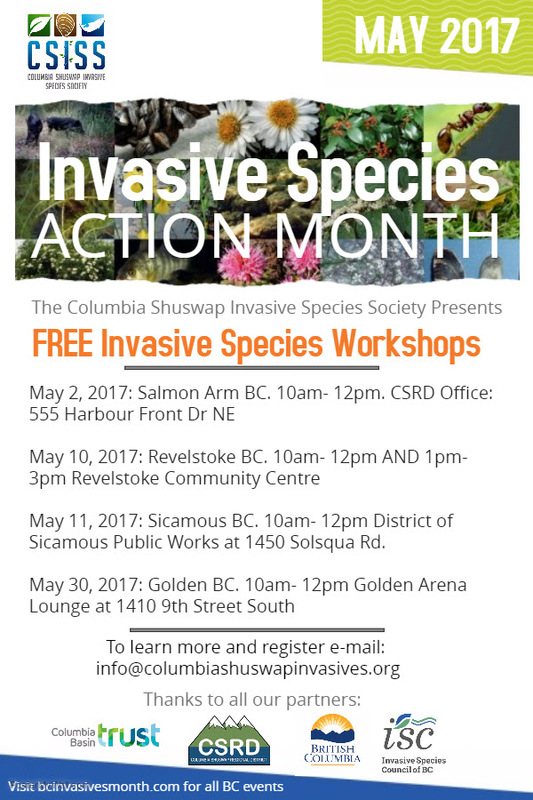 Contact Sue to organize presentations, workshops, and display booths at sdavies@columbiashuswapinvasives.org. We would also like to welcome Emily Spiler, returning for her third year with CSISS as Outreach Officer; and two Canada Summer Jobs students, Braden Lamoureux and Katlin McCallum. Continuing staff include Robyn Hooper, Executive Director and Laura Gaster, who has stepped into the role as Field Operations Program Coordinator. More info here about Our Team. Be on the look out this summer for our staff at events and in the field. Be sure to stop by and say hello!